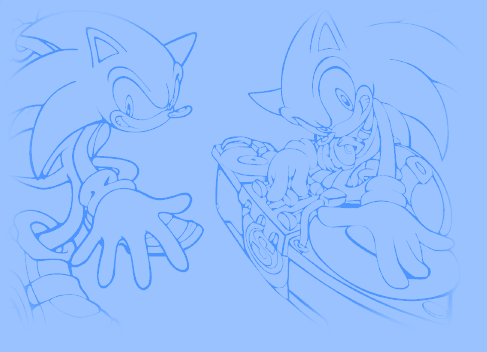 1 - Why naming this site "Sonic official Art Archive"? Is it affiliated with SEGA? 3 - Will you open a fan-art section in your site? 4 - Why are images so long to load? 6 - I can view PNGs (even those from the website) but I can't download an artwork because QuickTime handles it and sometimes even displays it at the wrong size, loosing transparency. Must I uninstall QuickTime? 7 - I've got nothing on my computer except Internet Explorer to view PNG images. And, even with that, double-clicking on a PNG file doesn't do anything! Do I need something special to view PNGs? 8 - How do I use the artworks in Paint Shop Pro? They all appear opaque, and surrounded with black! I have the same problem in Irfan View too. 9 - What does Truecolor+alpha PNG mean? 10 - Why does Dioxaz sometimes behave strangely on forums or by mail :p ?? Is he mad? Well, as long as you don't pick up the entire Sonic Art Archive to create a copycat of it on your website, you're free to take some artworks from here (what you think are the most interesting) and include them into a dedicated art section. Even if I'd prefer that you keep them in their original PNG format, you can feel free to convert them to JPEG and/or scale them down as long as quality is not too horrible. But remember, one thing: if you are about do that, ask me first, please, so I can know what sort of website you are running, what you plan to do exactly and the most important, even if neither I nor Hivebrain do own artworks, give credit the Sonic Art Archive by putting a link to it on each art page/section of your site (or the main art page would be enough if they are centralized). That would be the nicest thing to do, because of the huge effort involved to gather, optimize artworks and run the website. That's not possible and not reasonable. This site is here for official art or re-creation of official art (when the original piece is in a doubtful quality) only. It would take too much time to care about such a section anyway. If you want some fan arts, there are plenty places and forums to go to on the web. This website is provided as an archive where anyone who wants to create a Sonic-related item (a website logo, a wallpaper, a poster, etc.) has the possibility to use near-professional quality artworks in truecolor+alpha PNG format. It has been created by Hivebrain for functionality, rather than offering a simple image gallery. PNG images use lossless compression and transparency on an alpha channel. Although they're often bigger than JPEGs, they're relatively light to distribute on the web (mainly today with broadband connections and because of the visual comfort it brings, image quality is getting more and more important to our eyes... mainly to the Maniac of PNG's eyes :p ). But if you still have a narrowband connection (aka 56K), you may require a bit of patience to download artworks (most are between 300 and 500 KB). If there is one thing you must fit into your brain is that the Maniac of PNG (that's my nickname :p) loves PNG. So, I'm not responsible if you still have a really old browser that doesn't display PNG images. Or, if you're using Internet Explorer 4 or better and have this problem, it may come from a bad OEM installation. To fix this, just go to the Start menu and select Run... A dialog appears. Just type 'regsvr32 c:\windows\system\pngfilt.dll' (without the quotes) into the text field and click 'OK'. Close all sessions of MSIE that are still opened. Restart the browser, try to go to Sonic Art Archive again and try downloading an artwork (preferently one you haven't clicked on first), the bug should have disappeared ;). Another solution I really advise you is getting the last version of another browser such as Mozilla or Mozilla Firefox (all recent non-IE-based browsers have excellent PNG support). Native PNG support into Netscape is now restored (the bug may affect MSIE too, if this workaround doesn't work, let me know by mailing me at sonic-discovery @ fr.st). You can find a more detailed description, including screenshots, for how disabling QuickTime plugin support for PNG by going to the help section. lol, unfortunately, the two imagery applications bundled with Microsoft operating systems (I'm talking about MS Paint and Imaging) are the two exceptions that don't support PNG. In addition, on some OEM installations (I saw that on a Win2K installation once), nothing is configured to view images by double-clicking on them (sure you can still select 'Open with' and Imaging, Paint, or MSIE but that doesn't work for PNGs). For my part I consider Paint and Imaging not being decent tools for image manipulation. I recommand you to install IrfanView and use it instead to view the artworks and have the ability to make basic edits on various images types, including PNG ones. If you want to manipulate them by using the benefits of alpha channels, I recommand you GIMP, which is the best Open Source and free image editing program, similar to Photoshop. Photoshop, Fireworks and Paint Shop Pro are also great tools to deal with PNG images but they aren't free (but you can still download evaluation or trial versions of them). Just go into the Help section, everything is explained to show you how to restore transparency on a truecolor+alpha PNG in both Paint Shop Pro and IrfanView (viewing only for the latter). By definition, a Truecolor image can theorically display all the colors possible, by combiation of Red, Green and Blue components. There are 256 or 2^8 possibilities (or variations, each component of a pixel uses 8 bits) of each component, that, combined each other, gives us a maximal number of 16,777,216 colors possible (a truecolor image is also referenced as 24-bit because R+G+B = 8*3 = 24). An alpha channel is a sort of greyscale mask that will be glued to the image in order to define in it transparent and opaque regions. As each pixel of an alpha channel can have 256 degrees of opacity possible, we can easily have variable transparency on an image, like softened edges, drop shadows, halos, etc. This helps image editing to have a cleaner and more professional touch this way. A truecolor+alpha PNG image is also referenced as RGBA ('A' stands for the alpha channel) or 32-bit PNG (truecolor=24, alpha=8 and trucolor+alpha = 24+8 = 32 ;) ). And to finish, PNG is short for Portable Network Graphics. This image format has been designed in 1995 by the PNG Group in order to offer a free and Open Source alternative (and replacement!) to the GIF format. More info about PNG can be found on the official PNG website, maintained by Greg Roelofs (also author of the excellent PNG, the definitive guide book). :lol: the maniac of PNG has spoken again^^. lol, I can't imagine you dare asking a smilar question, really ^^;;; (fortunately it didn't happen yet...). By nature, and unlike how Hivebrain and normal people seem to be, The maniac of PNG is not a serious person. Life would be too sad if everyone was serious everywhere. That's why I tend to use some "excessive" expressions in my replies (on a forum or by mail) to express my delightness for example or use a very weird kind of humour. This may have repulsed some of you, but believe me it's not my purpose. I'm a nice guy in fact :p. You can think I'm mad if you want, but that doesn't mean I'm irrationnal. Or I wouldn't be maintaining this site :p.